Typical of the Irish financial industry’s inability to get anything right, today we learnt that the Central Bank is unable even to copy a couple of sentences without screwing up. 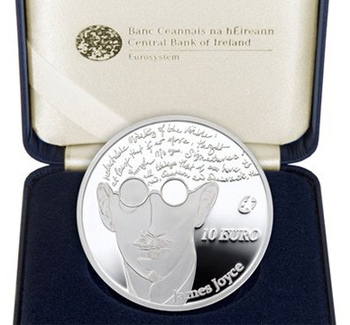 In what is clearly something of an embarrassment, betting tipsa limited edition silver €10 coin minted in honour of James Joyce contains an error in the Ulysses quotation inscribed upon it. The coin features a portrait of Joyce alongside a quotation from his most famous work (and perhaps the finest work of literature in the English language). While the error, arguably, isn’t a huge one (the insertion of the word “that” in the second sentence) it reveals much about the Irish Central Bank. Either it’s just a mistake – in which case, we see once again the sheer incompetence of those in charge of our money supply. Or it’s deliberate… and we see yet more of the arrogance of our bankers, believing themselves a better judge of how the lines should flow than Joyce himself. Sheer incompetence or blind arrogance? Neither are particularly desirable traits in those who control our finances. I have no money but if you will lend me your attention I shall endeavour to sing to you of a heart bowed down. Where would I get money? Mr Dedalus said. There is no-one in Dublin would lend me fourpence. And there are many many others that would better fit the mood of the times. I’ve written in the past about the way a city’s statues go some way towards revealing its soul. And let’s face it, the whole idea of statues is pretty amazing in the first place. Imagine if we encountered a previously undiscovered sub-species of chimpanzee who left intricately carved versions of their ancestors in the places where they gathered. Viewed objectively, it’s a strange thing for an animal to do. It’s a bit like leaving huge signs all over the place with the words “We’re really scared of Death” printed on them. Or maybe I’m reading too much into it. Still, however you explain it, there’s no question that a place reveals much about itself through its choice of statues. Certainly at the most basic level, the statue is a reassurance to us all. “Death is not the end”, it whispers, “For I am still among you”. But statues of anyone will fulfill that role. What’s revealing is our choice of exactly who we choose to call back from the dead to remain with us. Take London for instance… it’s big enough and old enough to contain statues of people from all walks of life. Engineers, nurses, scientists, fictional cokeheads, the lot. But mostly it’s soldiers. Lots and lots of soldiers. Men who excelled at killing people from beyond the city walls, or who were cruelly killed by people from beyond the city walls. And we invite them back to stand silently among us. One of them stands atop a pedestal so high, you can’t really see him clearly. Here in Dublin, the situation is quite different. There’s plenty of statues to fighters, certainly, but they tend to be rebels and revolutionaries, which alters the message significantly. And they’re equalled in number by poets, musicians and radical socialists. As well as the occasional statue to the ordinary people of the city. The stone celebration of military conquest that is so ubiquitous on the streets of London (and pretty much every city in a nation that once possessed an empire) is almost entirely absent here in Dublin. This is both a result of, and a further influence upon, the collective psyche of the place. Statues create a positive feedback loop that help solidify a culture. One of Dublin’s most striking statues, of course, greets you from the corner of North Earl Street as you walk up the city’s main thoroughfare — O’Connell Street. There he stands; artist and revolutionary thinker; James Joyce. 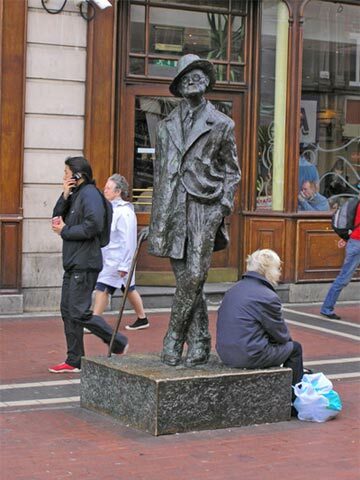 Many cities celebrate their local artists just as much as Dublin celebrates Joyce of course. But June 16th in Dublin is quite unique. I’d planned on doing the whole “Bloomsday thing” this year — y’know, donning period garb and following in the footsteps of Leopold Bloom’s Great Wander. I’d probably skip the breakfast of offal, but I figure I could make up for it with a couple of extra pints along the way. Sadly the day just crept up on me, and I realised too late that it was this week. Silly me. To make up for it, though, I have vowed two things. Firstly to re-read Ulysses (the single greatest work of literature in the history of humanity) before June 16th next year, and secondly to make absolutely certain that appropriate clothes are hired for both myself and Citizen S in plenty of time next summer. Anyone else up for it? You’ve got a whole year to plan it. And even if you don’t feel like dressing in a turn of (last) century stylee, it’ll still be a fine day out. There are sins or (let us call them as the world calls them) evil memories which are hidden away by man in the darkest places of the heart but they abide there and wait. He may suffer their memory to grow dim, let them be as though they had not been and all but persuade himself that they were not or at least were otherwise. Yet a chance word will call them forth suddenly and they will rise up to confront him in the most various circumstances, a vision or a dream, or while timbrel and harp soothe his senses or amid the cool silver tranquility of the evening or at the feast at midnight when he is now filled with wine. Not to insult over him will the vision come as over one that lies under her wrath, not for vengeance to cut off from the living but shrouded in the piteous vesture of the past, silent, remote, reproachful. — That’s your glorious British navy, says the citizen, that bosses the earth. The fellows that never will be slaves, with the only hereditary chamber on the face of God’s earth and their land in the hands of a dozen gamehogs and cottonball barons. That’s the great empire they boast about of drudges and whipped serfs. I didn’t search for those passages. Just opened three random pages and got three amazing pieces of writing. There’s not a single page in the 900 that doesn’t crackle with energy, beauty and insight.